You are here: Home » Uncategorized » Studio 550 Customer Appreciation Week! Studio 550 Customer Appreciation Week! Daily Deals, Freebies, oh my! Even though the year is just about over, we couldn’t go into 2018 without thanking our customers, partners, & supporters around the country. Without you, what we started in 2013, & the work we carry out everyday would not be possible. We want you to know, and hope you know, that you are what makes Studio 550 so special. You are why we fire up the kilns before dawn & why we strive to do good work throughout the greater community. In honor of you we are proud to announce our upcoming Studio 550 Customer Appreciation Week, November 27 – December 2, 2017. Each day we will have a new in-store deal as well as a special week-long deal online & in-store. Stay tuned for our big announcement November 27th! Come see and hold handmade ceramic cups made by artists from around the country! 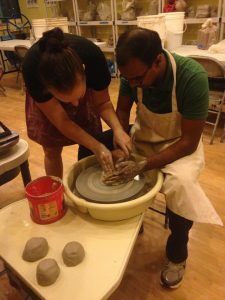 Simmer down & reserve a pottery wheel for play! 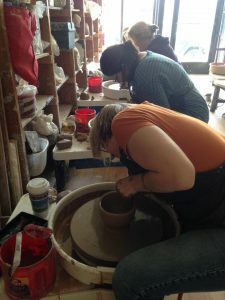 We’ll guide you through a basic pottery lesson and then you will be set free on the wheel to make your own creations! One piece per person is included in the workshop. RSVP here.